the only thing anyone seems to care about is cleaning out. Now, don't get me wrong. I'm all about a good deep clean post-winter. But in my mind, that's only one piece of the puzzle. You can clean all you want, but sometimes your home just needs a little extra something to have it feeling fresh. Enter the second piece of the puzzle, the sprucing up, aka things like switching out seasonal items, brightening things up and adding fresh new items. Because life is too short to have the same color curtains all year long, right?! Keeping scrolling to see just what we do to quickly freshen up our space for spring (or whenever it's feeling a bit drab), and how you can spruce up your home right now, too. What are some of your favorite ways to quickly spruce up your home? Similarly to the pillow covers, switching curtains out to ones made with lighter materials and colors is a simple way to open up and brighten a space. I've always loved stovetop potpourris, even when I was a kid. I just thought it was so magical how you could throw a few things in a pan, boil them for a little bit and then all of the sudden your house would smell wonderful. 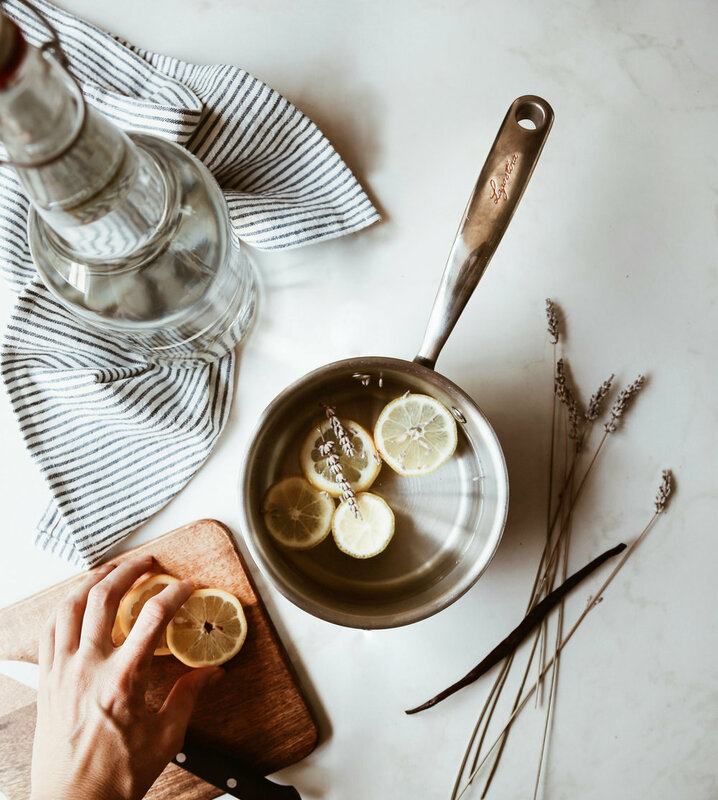 I'm sharing a "recipe" for a lemon lavender stovetop potpourri on Instagram today, but honestly, just about any citrus and handful of fresh herbs, maybe a dash of an extract, will do the trick. Ok, I know rugs probably aren't the first thing you think of as an easy way to spruce up a space. They're expensive, and it's often hard to find quality ones (Trust me, I get it. I've been on the rug hunt for the past 6 months.). But here's the thing, they make such a big impact on a room. Thankfully, places like Target and H&M Home now offer some great, smaller rugs, at really great price points. While you may not be able to completely switch out a rug in a room, you can layer on one (or even two) smaller ones to help change up/brighten up a space for spring. This might be another obvious one, but don't forget to switch out dark and musky scented candles for lighter floral or beachy ones. I mean, as much as I LOVE my pine scented candles, no one wants to smell Christmas trees when it's 70 and sunny out. True story- the first time I switched out our cushion covers, Dave was incredibly confused. He couldn't understand why I'd take off one perfectly good pillow cover only to put on a different one. Seasons, babe, seasons! Needles to say, he has since learned that, once spring rolls around, we switch out our cushion covers to ones in lighter materials and lighter colors. We're especially big fans of these cushion covers because they're linen, are available in 11 colors, oh, and did I mention they're under $13?! I mean, you could basically afford to switch out your covers once a week with these. Spring is synonymous with plants, so this one is probably a no-brainer. Regardless, it's still one of the easiest and best ways to add life back into your home after winter. Whether it's adding an herb plant to your kitchen windowsill, picking up something new for your patio, or switching out plants in your living room, even just one plant is enough to do the trick (but if you're anything like me, you probably end up with 10 new plants every time you head to the greenhouse). We have books and magazines scattered throughout our home as decorations, inspiration and, sometimes, even "furniture" (aka a stack of magazines as a small side table). Just make sure you switch them out every once in a while, so, ya know, it's not June, but you're showcasing a magazine with Halloween ideas.